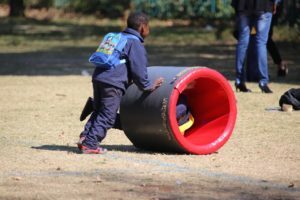 Three2Six provides support to Johannesburg-based refugee children waiting to enter mainstream schooling in South Africa. “Today marked a humble but exciting milestone. The Three2Six refugee education project extended its provision to Holy Family College, Johannesburg, and the first classes were held today. 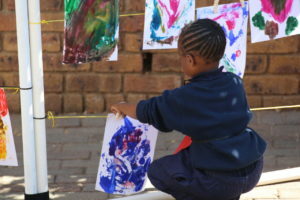 Fourteen Reception class and grade 1 learners (aged 6-7) attended: playing in the playground, drawing and colouring, introducing themselves to new friends and teachers, singing and sharing a meal. Creative activities enable many of Three2Six’s Johannesburg-based learners to process their experiences as refugees from neighbouring war-torn countries. The occasion was marked by a small welcome ceremony with College leaders and the Three2Six Committee. Rabbi Sa’ad from our project partner, Beit Emanuel Synagogue, led us in a prayer and then the children bravely introduced themselves and joined the adults for afternoon tea. 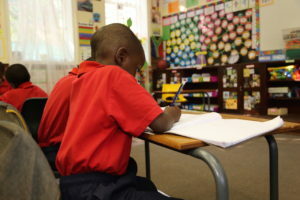 Refugee children receive literacy and numeracy lessons whilst waiting to join mainstream South African schools. We arrived inside the playground gate and the Three2six children were immediately surrounded by curious Holy Family learners from the after school club. They listened as we went over the playground rules and, again, there was a chorus of “Welcome!” and “Oh yeah, we heard about you”, followed by “Come and play with us!” I was so touched. But what happened next moved me beyond measure. Without any prompting, the Holy Family learners took each of our Three2Six children by the hand and led them to go and play. Within seconds the playground was full of laughter. Holy Family learners encouraged small Three2Six children to climb the ladder and try the slide. A group called our two oldest boys to join their soccer game on the main field and five Holy Family learners lined up to push five Three2Six children on the swings. Three Johannesburg schools share their facilities with young refugees waiting to enter mainstream South African education.